I am writing this letter on behalf of Friends of Summerdale Civic Association, to offer our support in your attempt to stop the opening of the methadone clinic in your community. On behalf of this community, I can say that we are appalled by what has taken place and are very familiar with these, “behind the scenes” deals that are made, and the community is left out. In Summerdale, we were not informed when the School District purchased the JFK site, and was gong build a new high school. As community leaders, and people who live in these areas we have a right to fight for what is best in our neighborhoods. We feel that it is not in the best interest of the community of Mayfair/Holmesburg to have this type of clinic in the neighborhood. The type of people who go to these clinics are not working class people. They are addicts trying to get another hit. I am very familiar with this activity on a personal note and will do what I can to support your community. We all know that there are plenty of other empty buildings or vacant land areas that would be a better place for this clinic, away from the residential areas. These types of facilities are not something that should be placed in residential areas, as there are families with young children, and seniors who like to walk on Frankford Ave.
As I said before, on behalf of Friends of Summerdale Civic Association, we will support you in your efforts to save your neighborhood. Please feel free to contact me if I can offer any assistance. Please accept this letter on behalf of the Greater Bustleton Civic League as a statement of our opposition to the proposed placement of the Healing Way narcotics treatment center at 7908 Frankford Avenue in Philadelphia. 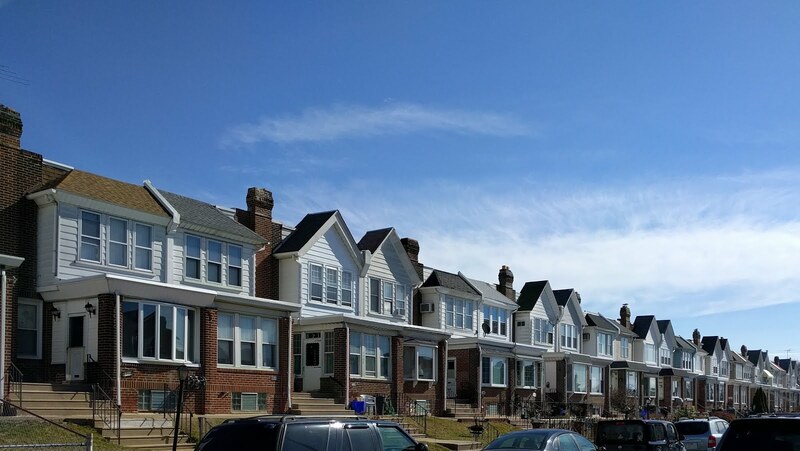 The Bustleton neighborhood of Philadelphia borders the Holmesburg and Mayfair sections, and shares many of the same demographic traits; a mix of business, homes, schools and churches. We stand with the Holmesburg Civic Association and the Mayfair Civic Association and strongly support their opposition to the opening of a narcotics treatment center in their community. Area Civic Association’s work very hard to help mold a community that strikes a healthy balance between business development and residential attractiveness. Whether it occurs in Bustleton or Holmesburg, the establishment of a narcotics treatment center reduces the appeal for both business and families. We ask you to deny the application of the referenced business and demonstrate your understanding of the communities stated preference. The Holmesburg Civic Association (“HCA”), Mayfair Civic Association (“MCA”), Mayfair Business Association (“MBA”) and Mayfair Community Development Corporation (“MCDC”), in response to neighborhood outrage as well as a community rally that brought hundreds to the proposed location, will hold a community meeting at Lincoln High School to address the opening of a proposed Methadone Clinic in our neighborhood at 7900 Frankford Avenue (at Decatur St.). The purpose of this meeting is to inform the Holmesburg and Mayfair communities of developments relevant to this issue. Panelists will then address the crowd individually and take questions at the conclusion of the presentations. Invited panelists include Fred Moore, President of HCA Joe DeFelice, President of the MCA, Mike Scotese, President of the MBA, Suzann St. Marie, Executive Director of the MCDC, City Councilwoman Joan Krajewski, State Representative Kevin Boyle, State representative Michael McGeehan, State Senator Mike Stack, US Congresswoman Allyson Schwartz, 15th Police District Captain Frank Bachmeyer, Dennis Kulp, Owner of Villa Anna Associates (the leasing agent for the property) and Carl primavera, Attorney for The Healing Way, Inc., i.e. the proprietor of the proposed methadone clinic. The Meeting will begin promptly at 6PM with opening and panelist remarks occupying the first hour and questions from the audience consuming the second hour. We recommend that the community try to arrive thirty minutes prior to the event to insure there is adequate seating as this meeting is expected to draw in over Five Hundred (500) community members. Panelists may be represented by their staffers. In regards to: The Healing Way, INC 7900 Frankford Ave. This letter is to serve as notification to you of Holme Circle Civic Association’s strong and well founded opposition to the opening of a methadone clinic at 7900 Frankford Avenue. • The location is 100% unsuitable for a methadone clinic. There is a daycare, two (2) churches and two (2) schools all within 200 yards of the proposed location. The daycare and church are right across the street. Frankford Avenue is also major commercial artery for Mayfair and Holmesburg. Housing a methadone clinic in a busy commercial district will only hurt businesses and jobs in the neighborhoods. • The clientele are drug addicts, and untrustworthy. The assumption is that the adjacent residents and businesses will not trust these addicts. There is a strong possibility of increased burglary, robberies, and theft and frankly the Northeast cannot afford to take these risks. Will the 15th districts receive additional officers? • The majority of drug addicts are smokers, and as you are prohibited to smoke indoors, the individuals will be smoking outside which will result in littering and an intimidation factor to business patrons and neighbors. 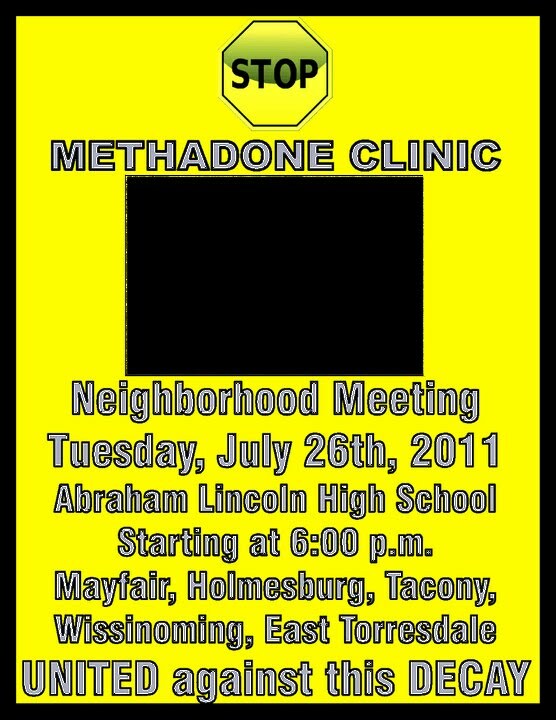 • A methadone clinic will attract drug dealers to the neighborhood because they will know exactly where to find the buyers. Drug dealing may actually be a direct result of the clinic. It has been documented in numerous cases that users obtain the methadone from the clinic only to turn around and sell it on the street. • Property Value. In addition to the aforementioned reasons, the property value of the surrounding area will decline because home buyers and business patrons will simply choose to move to an area without a methadone clinic. The Northeast is slowly changing, and not for the better. I am imploring your assistance to help maintain what dignity the Northeast has left. Good article about how far our community has come. This letter is submitted to you on behalf of the Mayfair Community Development Corporation. 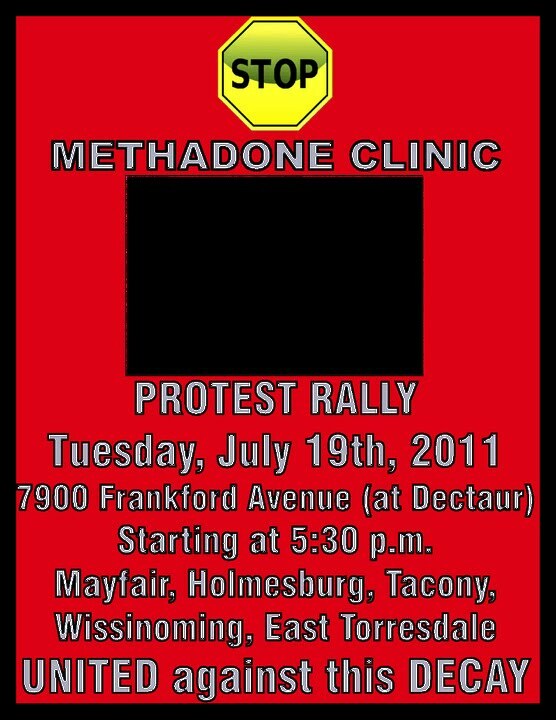 Our community would like it publicly stated that we are against the above referenced Methadone clinic. The MCDC was formed in 1999 since then we have worked hard in rehabilitating and selling 23 homes. Eight were multi family converted back to single family. Eleven were sold to single parents. Six were sold to first time buyers and the one was redeveloped for total handicap accessibility. MCDC has built two mini parks, a community and senior center to name a few. MCDC also responsible for quality of life and greening programs throughout our neighborhood. In our business district we have just completed a Streetscape Program which included stamped sidewalks, median greening, benches, planters, trash cans, banners, decorative lighting, fencing, plants and trees. On top of that we are responsible to maintain these areas through our Clean Sweep program. At this proposed location along our main business corridor it is surrounded by Seniors and Children. Below many of these places can see the sight from there front doors and the others are no more than 2 blocks away. JH Brown Elementary School, Guppies Childcare Center, Munchkinland Day Care Center, Little Ducklings Day Care Center, Holmesburg Baptist Church and Grade School, India Pentacostal Church, Holmesburg United Methodist Church, Living Waters Ministries, Mount Zion Baptist, Emmanual Episcopal Church, Fountain of Life Church and the Holmesburg branch of the Free Library. MCDC maintains a strong working relationship with our Business association, Civic association, Town Watch, and our neighboring Civics to preserve the quality of life in our community. I would like to inform you that the Morrell Park Civic Association and Town Watch support the Holmesburg Civic Association, the Mayfair Civic Association and many other Associations in their OPPOSITION to the proposed Methadone Clinic located at 7900 Frankford Ave, Philadelphia. We oppose the issuance of a license to distribute narcotics, specifically methadone at this location. There are three daycare centers, churches, an elementary school, a public library and hundreds of families located within a short walk from 7900 Frankford Avenue. This location as a methadone clinic poses a direct threat to the quality-of-life of our neighborhood community. As a family orientated neighborhood this clinic will potentially lead to the collapse of Frankford Avenue as a commercial corridor, destroy the quality-of-life of the Holmesburg neighborhood, devalue homes and accelerate the relocation of hard-working Northeast Philadelphians. Our concerns also include the security and safety of those in all neighborhoods who are connected by SEPTA’s 66 bus route to daily necessity, employment, and entertainment. Thank you in advance for your time and consideration in reevaluating the licensing of this facility. 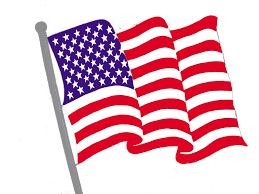 civic association in the NE is trying to stop it. property at 7908 Frankford Ave at Decatur. 2) Attend the public meeting, Tuesday 26 July, 6pm at Lincoln High. Standing together, we can stop this. You received this message because you are subscribed to the Google Groups "Mayfair Business Association" group. To post to this group, send email to mayfairbiz@googlegroups.com. To unsubscribe from this group, send email to mayfairbiz+unsubscribe@googlegroups.com. For more options, visit this group at http://groups.google.com/group/mayfairbiz?hl=en. Please accept this letter on behalf of the Mayfair Business Association (“MBA”) which represents the businesses of the Mayfair Community as well as the businesses along Frankford Avenue from Solly Ave. to Harbison Ave. in Northeast Philadelphia. We stand in opposition to the above referenced business and support the Holmesburg Civic Association (“HCA”) and the Mayfair Civic Association (“MBA”), of which I serve as President, in their opposition as well. The location of the property is within one city block of three day care facilities, a Christian elementary school, hundreds of houses, a public library that attracts many young students and in addition to these properties; other schools including JH Brown Elementary are all within a very short walking distance of the location. Since this issue came to light, many businesses have stated that they would sell their property and move outside the City if this is approved. We have worked very hard over the last five years to restore “the Avenue” to a place where people want to come for both leisure and shopping essentials. An establishment like the one above would drastically decrease the quality of life and make this destination less desirable and, in our opinion, less safe. Since our organization was reformed, we started our annual “Mayfair May Fair” which highlights the businesses along the Avenue complete with an action packed weekend of giveaways, safety expos, rides, performances, etc. We have also restored our annual Thanksgiving Parade which brought thousands of people back to our neighborhood as well as our annual Christmas Tree lighting which also is featured prominently along the Avenue. We feel that opening an establishment like the one above will negatively impact all the work we have put in and force residents and neighbors alike to give up on our community. We will not give up and therefore, we urge you to deny the application of the above referenced business for the reasons stated above. Should you have any questions, please do not hesitate to contact me at the number below. Letter from Fred Moore, President of Holmesburg Civic Association, to Congresswoman Allyson Schwartz. News of a proposed "methadone clinic" to be located at 7900 Frankford Ave, one block south of Rhawn and Frankford, has shaken the Holmesburg/Mayfair community in Northeast Philadelphia to the core. This is the heart of Holmesburg with many nearby churches, schools, daycares, library, firehouse, and a vast network of single family dwellings and small businesses. We are all struggling to sustain a foothold in these trying social and economic times. The stigma associated with "methadone clinics" has resulted in extremely negative expectations, perhaps even the death knell of our community. In addition to the many well documented reports of abuse and misuse at "methadone clinics" our ignorance and fear of the unknown are fueling the blazes of outrage. The ignorance is not entirely of our own making. Numerous attempts have been made over the past 6 months - since January 2011 when the Phila L&I permit was posted - to get information on what kind of medical practice was planned for the 7900 Frankford Ave facility, to no avail. There has been absolutely no transparency or the slightest attempt on the part of the medical facility or anyone associated with it to reach out to the community. Quite the opposite has been the case. It is now confirmed at this late date (as of last Wed, July 13) that an application has indeed been submitted to the PA Dept of Health for a license to distribute narcotics (ie, methadone) at the as yet to open medical facility at 7900 Frankford Ave. The State DAPL (Drug and Alcohol Program Licensure) approval is only one of the government agencies needed to get the clinic up and running. There are also two Federal agencies that must approve the application, DEA and CSAT. The Holmesburg and Mayfair Civic Associations have banded together to oppose in the strongest possible terms this potentially fatal injection into the center of our residential communities and the vital Frankford Ave business corridor. A meeting is scheduled for Tuesday, July 26 at 6 PM at Lincoln High School. Your attendance would be much appreciated. FYI: An on-site rally at 7900 Frankford Ave is also scheduled for 5:30 PM, Tuesday, July 19. Tomorrow. Please accept this letter on behalf of the Mayfair Civic Association (“MCA”) which represents the neighbors of the Mayfair Community. We stand in opposition to the above referenced business and support the Holmesburg Civic Association (“HCA”) and the Mayfair Business Association (“MBA”), of which I am also a Board member, in their opposition as well. The location of the property is within one city block of three day care facilities, a Christian elementary school, hundreds of houses, a public library that attracts many young students and in addition to these properties; other schools including JH Brown Elementary are all within a very short walking distance of the location.. In all my years of being civically active, I have never seen an issue ignite the community as much as this has. I have had several hundred people reach out to me furiously in opposition and have not heard one instance where someone is in favor. Also, many businesses have stated that they would sell their property and move outside the City if this is approved. We, the residents of Mayfair and Northeast Philadelphia alike, are engulfed with neighborhood pride; the kind one wears on their sleeves. Many of us were raised in this neighborhood and are raising our children here as well. Many other surrounding community groups such as the Upper Holmesburg Civic Association, Tacony Civic Association, Holme Circle Civic Association and Morrell Park Civic Association have also joined us in opposition. We plan on fighting this business until the very end. 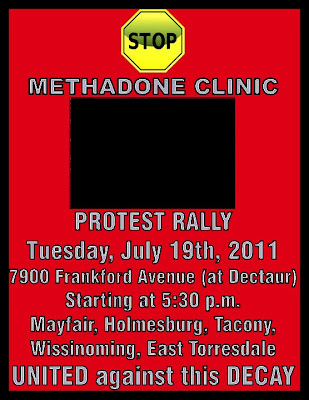 We have organized a protest for Tuesday July 19, 2011 and a huge Community meeting for Tuesday July, 26, 2011. Therefore, we urge you to deny the application of the above referenced business for the reasons stated above. Should you have any questions, please do not hesitate to contact me at the number below.